Residential and Commercial Concrete Contractors Southeastern Wisconsin | Concrete Walkway, Driveway & Parking Lot Installers Milwaukee | Asphalt Contractors Inc.
Asphalt Contractors Inc. provides experienced, professional residential and commercial concrete services in Milwaukee and SE Wisconsin. We have over 30 years’ experience ranging in a wide variety of applications. Building a house from the ground up and need a foundation laid out, or need concrete laid at a commercial level? Not a problem – From excavation and site preparation to completion of your new concrete project, we have you covered! Contact Asphalt Contractors Inc. for the best concrete services in SE Wisconsin. Your concrete driveway is an essential aspect of your home – whether you’ve just built a new house or are finally ready to pave over that gravel patch, our concrete contractors will make sure you get the most from your investment. We utilize the best equipment, products, and paving process to assure a long lasting, low maintenance concrete driveway or walkway. Not only will your residential concrete project be visually appealing, it will also be functional. Asphalt Contractors Inc. understands that your home is a point of pride, and is meticulous when planning and installing walkways and other concrete features. We promise an easy experience and 100% satisfaction with the end results. The quality of your driveway, parking lot, and walkways are a direct reflection on your business. An expertly installed concrete parking lot adds value to your property; while a bumpy, pot hole filled lot can cause damage to your visitors vehicles and in turn customer frustration. A poorly laid concrete walkway will result in cracks and an uneven path that has the potential to cause injury to your customers or staff. 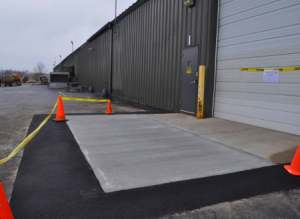 Trust Asphalt Contractors Inc. for commercial concrete services you can rely on. We make sure the job is done right so you can reap the benefits of your investment. Get a free estimate today! If you have a residential or commercial project in Milwaukee that requires expert concrete services, Asphalt Contractors Inc. is the answer. We take craftsmanship to a new level when designing and installing concrete walkways and driveways. We know durability and function are as important as aesthetic appeal, and are capable of meeting your specifications, no matter how unique. So whether you’re building a new retail space and want beautiful concrete sidewalks and curbs to enhance your store front, or prefer concrete to asphalt for your home’s new driveway, our contractors can accommodate. We are a full service asphalt and concrete paving contractor servicing Southeastern Wisconsin and Northeastern Illinois. Whether you are in a residential setting, a commercial setting, or in between – our experience contractors will provide the solution best for you! Contact Asphalt Contractors Inc. for the best full service asphalt paving, patching, concrete, excavation, and like services.